Your kid just deleted your saved games - NOW WHAT? About 50 hours – more than a parent clocks in the average work week – just went down the tubes. Deleted. Gone. No way to retrieve or undo it. My little angel just deleted my saved game totally by accident. Look, I know that the Nintendo Switch Online service provides cloud saves for many games - but not this one. Not this time, at least. Let’s pause here for a second. As a gamer parent, parent of a burgeoning gamer and someone that works in the games business, it’s hard to look my kid in the eye sometimes and tell him that I’m playing a game in the name of work. But there you have it. Welcome to the ridiculous side of my already-ridiculous life. Trust me, I know how goofy this all sounds. So when I say that my kid deleted 50 hours’ worth of game save from my Nintendo Switch, that’s actual work time. And it was a totally innocent accident that he knew he screwed up about 5 seconds after he did it. Sure, I was disappointed in the moment, but what am I gonna do? Yell and scream and get all bent outta shape? Hell no. Laugh about it and move on? Well….let’s not talk crazy. That said, this was a perfect learning moment for both me as a parent and my kid in the consequences of actions. Do nothing. Sure, games are ephemeral, silly things and this was a viable option on the table. However, doesn’t a lack of consequence teach him it’s OK to mess with stuff that’s not his? Ground him. No Nintendo Switch for “X” amount of time for using the Switch without me around. Seems like a knee jerk, harsh punishment. Gang press him into playing that game until he can’t stand it, “Brewster’s Millions” style. Umm, this borders on seriously cruel and unusual. Or could backfire altogether. Find the save that he put the most time into in a game and delete it. What kind of monster do you think I am? NO! Make him play the same game with me, co-op, starting from the beginning and making sure we work together as a team. I went for choice 5. Since he’s limited to 30 minutes of screen time a day when he earns it, I made sure that the only game he’s allowed to play for the foreseeable future is the one where he deleted the save. Fortunately, it’s an E-rated game (suitable for all ages) that has a co-op feature. He can move on to play another game at my discretion, but for the most part, we’re now working as a team to go back and unlock everything that was part of the accidental deletion purge. The fully intentional side-benefit is that he looks forward to teaming up and tackling challenges together. We’re working on team-based communication skills. We are solving puzzles and going through a story together. 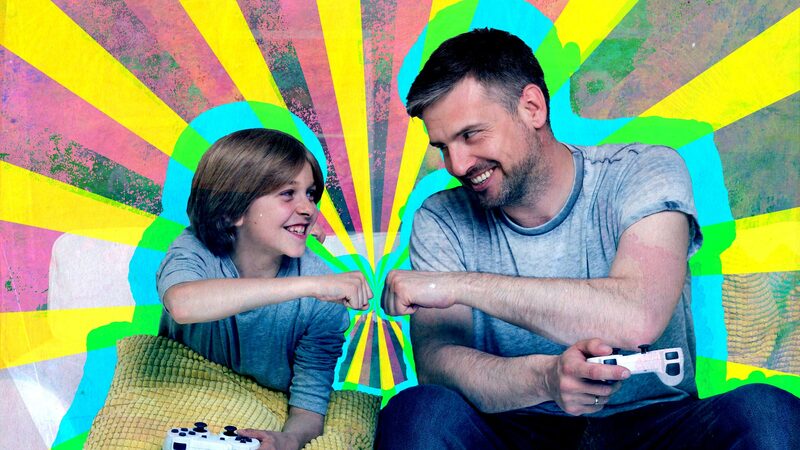 Most important, we’re sneaking in some more quality father-son time – the best excuse of all. While we always have fun playing together, forcing him to open his mouth and talk side-by-side with me as we play has opened him up to planning and thinking things through together more. And it’s more than just him asking me for help on solving something. Who says the gaming legal system doesn’t work? Cloud saves are key – when you’re able to do it. If you’re investing tens of hours into a game, a couple different backups are a good idea (cloud, storage to a separate drive / file when possible, and so on). Lock down your system (if it’s a Switch, keep it in a separate location. Or lock access to user accounts during certain hours) so that your kids can’t screw with stuff when you’re not around. We’ve also got some parental control gaming tips for you right here.